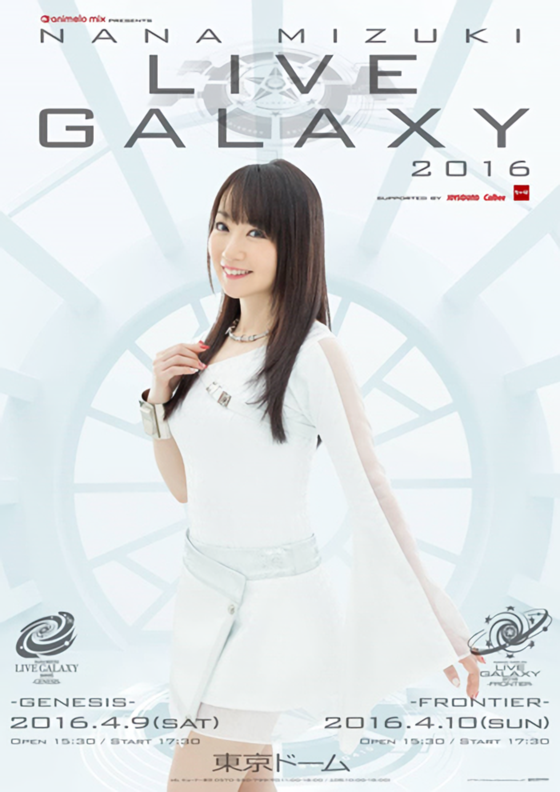 36-year-old anime voice actress Nana Mizuki held her second Tokyo Dome concert, titled "NANA MIZUKI LIVE GALAXY 2016" on this Saturday and Sunday, attracting 80,000 audience in two days. Her first concert at the internationally famous baseball stadium was held in December 2011. She was the first anime voice actress who was able to hold a solo concert at the huge venue with 42,000-55,000 capacity, and has still been the only one. The first day titled "GENESIS" featured her 2000-2007 songs mainly, then the second day "FRONTIER" was dedicated to her 2008-2014 songs, and the selected seven songs from her 2015 activities were performed on both days. In the end of the second day, it was announced that her next stadium concert will be held at Hanshin Koshien Stadium (capacity: 47,508) in Nishinomiya-city, Hyogo Prefecture, on September 22, 2016. Koshien is the home stadium for a Nippon Professional Baseball team, Hanshin Tigers, and Mizuki has been known as a huge fan of the team.